Human beings are a combination of matter and energy. So what is left when we die? Why have these spirits stayed on, and what can they tell us? 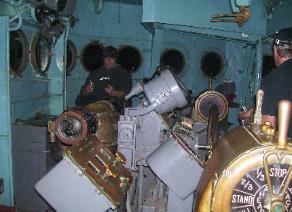 Port City Paranormal® began investigating the battleship because we were simply curious, much like many of you. We have had many cases through the years but visiting a site once or twice is all that is allowed by many who call us for help. In reality one vigil is not enough to explain or identify paranormal events. 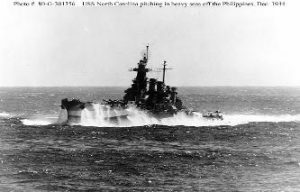 The Battleship North Carolina is a rare opportunity to research the same haunting multiple times, and to compare data gathered over time. We hope to achieve a tangible understanding of this haunting and communicate it to all who are interested. Our research helps us understand the history of the Showboat, the war era, and the people who lived and worked on board this gallant vessel. We feel the paranormal investigations we conduct help to save a yet untapped source of our heritage. The Battleship North Carolina began her life in 1937 at the Brooklyn Naval Yard. Forth in line to have the name North Carolina, and she was the first new construction battleship of WWII. Due to some troubles with engine vibration, BB55 was jokingly referred to as “The Showboat” as she sailed up and down New York harbor working out the bugs. 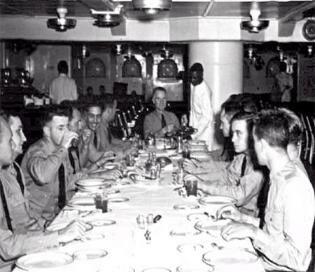 Commissioned in 1941 she headed to her home port Pearl Harbor. The USS North Carolina lived up to her nickname by being the most decorated battleship of WWII, earning 15 battle stars. The ship took part in every major battle in the Pacific. During her time fighting in the Pacific, she lost 10 men in combat and had another 64 wounded. August 24,1942, During the battle of the Eastern Solomons, the ship was strafed by a Japanese plane, killing Geo. Conlon. rising water and burning fuel oil when the water tight doors were sealed. 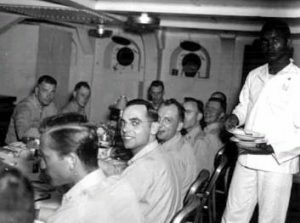 April 5,1945 While fighting kamikazes, three men were killed by friendly fire to the #5 port director: Edward E Brenn, John M Watson and Carl E Karams. That same day Eldon Means was lost at sea when the kingfisher seaplane flipped. 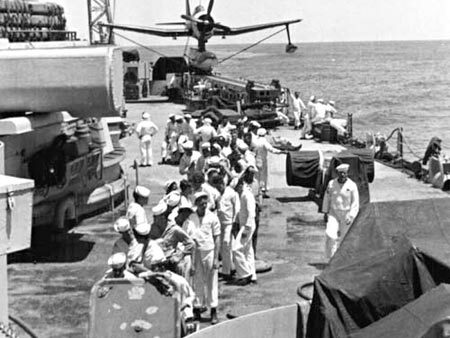 Several other deaths have occurred on board: Robert Nelson was accidentally killed by the .30 cal machine gun, Thurman Thompson died from a skull fracture, and Millard R Nieman died from septicemia. Frank Merck died from an unspecified accident, Henry J Kobierski died of cardiac arrest,and Norman Guilliam drowned at a party on an island in the Marshal Islands. 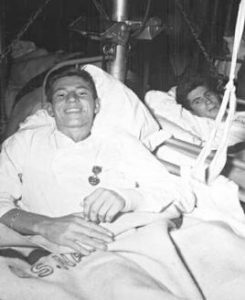 Jesse F Nucholus was killed while on shore leave. Earl J. Winthrop, of the USS Ticonderoga was transferred to the North Carolina and subsequently died of his wounds. Thanks to the efforts of many school children the battleship was saved and brought to Wilmington and dedicated in 1962. The Battleship North Carolina is now a memorial to all those who served and died in WWII. On the following tabs We have tried to consolidate all of our investigations of the battleship and will add more information as we continue our research. We want to thank the Museum and Archives departments, and all the staff for allowing us to continue our research. The evidence presented here is the property of Port City Paranormal. Everything you see here is real. In some cases audio has been modified for the purpose of clarity. We have verified all evidence to the best of our abilities. Sick Bay was very active that evening, the sounds of footsteps, shouts and muffled voices echoed down from the darkened passage way. Phantoms seemed to rush by us as we stood in the Warrant Officers mess. EMF meters placed at one foot intervals in the passageway repeatedly signaled high readings that moved in a wave-like pattern. Outside RF (radio interference) was ruled out, but we were not able to explain the phenomena. This brief note does not do the Battleship justice, it was only our first visit…..
Little did we know we would return to investigate the Battleship time and time again. Each investigation brought us closer to the spirits of BB55. They knew us as friends, and began to tell us more. 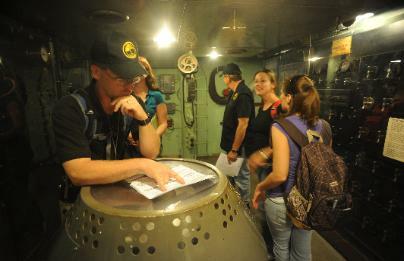 With the whole ship now open to investigation, the Port City Paranormal team returned to continue our research. Not all vigils are listed but all outstanding evidence is included here. Our December 2009 vigil was unusual as we had a film crew from the university working on a documentary of Port City Paranormal, entitled ” Soul Mates”. With the temperatures dipping into the thirties we were wondering how long we could last in the bowels of the ship. Using both wireless and hard wired cameras, we set up to record as much of this vigil as possible. Digital audio recorders were also placed to document the night’s activity. Later, after some of our team left early, Doug and I decided to investigate by ourselves. Having gained permission to go off the public tour route, we made our way back down toward the brig. We checked on our camera equipment and moved about the lower decks, all the while talking to the spirits that we hoped would respond. Tension mounted as each step we made eerily echoed back from the pitch dark passage way. We laughed half heartedly and commented, “This is a good time for a ghost to appear!” Not a second later, as we turned to enter the engineers office, something zoomed from the darkness directly towards my face!I snapped my head back, and collided with Doug, almost knocking him off his feet. Whatever it was came so fast, and was so close it was a blur. I focused and saw a face staring at me; leering, just inches away from my nose was the face of a man! Time slowed …. I saw his skin was pale and his large blue eyes sparkled. His hair was yellow with a reddish tint to the ends and it seemed to float about his head and face. Just as I realized what I was gaping at, he broke a big smile that widened into an even broader grin. He seemed quite amused at my startled response. Then, just as fast as he appeared, the face retreated back into the darkness till there was only a tiny point of light in the distance. The speck of light winked out and he was Gone! Doug! Did you see that?” I thought about a story Danny’ told us, about the man with the burning head… No, Doug didn’t see it, but Danny Bradshaw and I have! On that frigid night, twelve team members prepared for this vigil. Temperatures were already in the mid 40’s as we set up our gear. We planned a full out assault using 6 IR video cameras with sound, our personal recorders and almost everything listed on our equipment list! From past investigations and our research into the ship’s history, we were armed with new questions. Our goal was to try to identify individual spirits. We wanted to know who they were, and why they were still on the ship. Soft whispers and mumbled voices followed us through the ship. Knocks and bangs answered our questions. We used EMF detectors to detect slight changes in magnetic energy fields, backed by RF detectors. In theory the spirits can use this same equipment to communicate. There is no definitive proof of communications using flash lights or meters, but EVP recorded during these sessions, backed up our experiments using alternate means of communication.. The video that we have posted here, is just one of the unexplained events that occurred during this vigil. In the following video, Jane, Jennifer and Ali, head down to the brig area at 1:00am. Doug came with us so he could change the disc in our static video set up near the brig. As Doug worked, the “girls” entered the brig and began to explore the first cell on the right, taking pictures and conducting an EVP session. With his back to the brig, Doug changed the disc and restarted the video camera. He labeled the old disc, stored it, turned, and walked back to main deck and returned to his group. We are still trying to understand how this event occurred and invite all to write us and share your theory. What happened during those few moments while his back was turned, still remains a mystery.Our personal audios recorded the ‘girls’ EVP session, the camera sounds, but no noise of the cell door moving . The actual squeal of the metal recorded plainly when we opened the door to leave the cell, but NO sounds other than our voices were recorded by camera or personal recorder while we were inside the cell. Jane stood with her back inches from the cell door the entire time, and is sure the door did not move. Jen and Ali were facing the cell door and saw no movement. This video remains unexplained… Could this be a residual event, a phantom object or doppleganger or perhaps a glimpse through a portal or rip in the fabric of space & time? This next video was shot from Officer’s Country looking back at Sickbay… We are unsure of what we have captured, ghost, shade or alien? Sickbay was active that night, with EVP and recorded bangs and knocking. We developed our Grid system to investigate the ship, and now use it to coordinate all our investigations. The system has proven to be a beneficial tool to prevent contamination of evidence from sounds traveling through the ship and it assures that no group is close to or over top of another group of investigators. For years after this investigation we can refer back to this form to see who was where at any moment in time, and compare individual recordings. Contact us if your team would like to join us for a professionally conducted investigation. It has been a long time since we stepped aboard the Battleship North Carolina to talk with her dead. We miss the “Boys” and wondered if they would remember us. Would they welcome us back, or retreat into the shadows? We chose the Battleship because for two reasons, the first being we love the spirits of the brave men who served aboard BB55, and secondly being familiar with the haunting, it is an excellent place to train our new folks.At first the investigation seemed more like a reunion of our team members and old friends we treasure working with.One of our new trainees reported on their first investigation below. 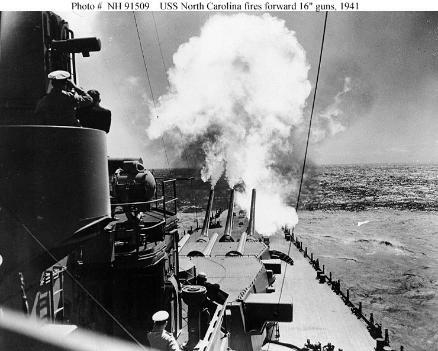 As we stepped onto the deck of the Battleship USS North Carolina, We knew we would not be not alone. Something more than just our team was aboard that night. We started our investigation in sickbay, and worked our way towards the bow of the ship. At first, I did not see or hear anything that I would consider abnormal, then as we passed the sickbay, we entered a long dark passage. Even though it was quite empty, I felt like someone was watching us. An eerie feeling of an extra presence gave me the creeps, but after investigating for a while, I got used to “not being alone.” If there are spirits here, perhaps they were unsure what to think of us, and decided to sit back and watch. group, taking with him the sense of uneasiness that had surrounded us. Looking back at the experience, I feel like the poor “guy” could not bring himself to just shove a woman aside, but he needed me to move P.D.Q, and move I did! I would never want to get in the way of a busy officer! But, how do I know he was an officer? I am not sure; I can only say he left quite an impression. For the few seconds he and I crossed paths, it was as if I knew all about him. He was big burley guy, and he carried himself with an air of authority and urgency. He was on a mission, and I just happened to be in his way! Being accompanied around the ship by unseen sailors is a strange new experience, but I have been told this is only the beginning of a long wonderful journey! Note to our phantom hosts on BB55: Thanks for your hospitality and making a girl feel safe! 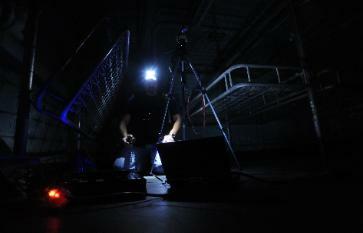 During our first full investigation, we were amazed how large the ship was and how lost we could get in the darkness. 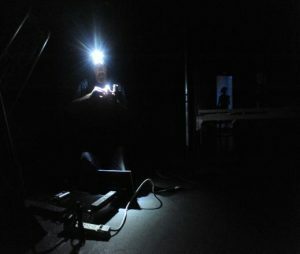 Most of our investigations were performed in subdued light. Covering the investigation with video and audio proved to be tricky due to the ship’s great sise and limited access to power after hours. This and all following investigations were documented using special IR camera setups to record directly to disc, eliminating the need for the usual “central command” and the miles of power cords,wires and cables used by most teams. From that first night we were convinced the ship was haunted! K II hits everywhere, some lighting up in sequence as if several “spirits” had walked by in succession. Our female investigators, especially the blondes, felt gentle tugs on their hair. 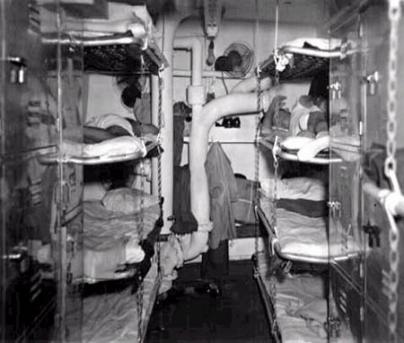 The Mess areas, passages near sick bay, and #4 engine room seemed to have the most activity. One investigator will never return to the battleship. She reported being touched several times in conjunction with high KII readings. When something brushed by her shoulder, we observed her KII go red and stay red until she exited the area. As she exited, she stated firmly ” You are scaring me, please stop! You stay here, but I have to go!” At that moment all KIIs went quiet. 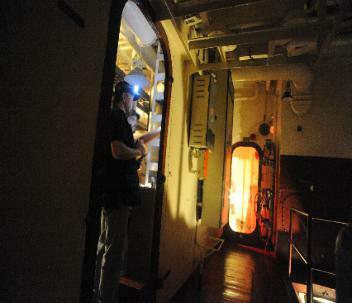 Members of our team had seen the first of many shadows that roam the ship, various anomalies were recorded, including cold spots in the bull pen and engine room. 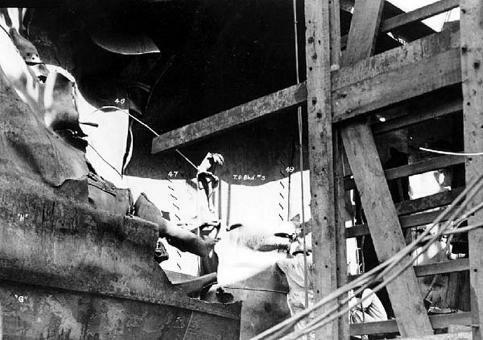 The most astonishing evidence of the investigation was the recorded sounds of the “Big Guns” firing throughout the ship. Faint at first, the sound increased as it occurred again and again. Boom… Boom… Boom! 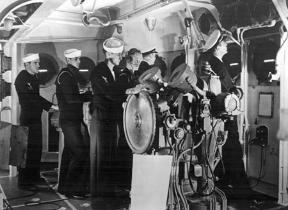 The sound was recorded simultaneously from different areas of the ship. We have not been able to recreate or disprove the “Big Guns”, but laterresearch of the ship’s archives revealed our investigation was within a few days of the anniversary of the Bombardment of Okinawa. It would be five months before we returned to the ship for our second investigation, giving us a chance to study the ships archives. Loaded with history, photographs, battle plans, one Ouija board and miles of files, the archives is a treasure trove for those who know where to look. Going through stacks of documents, some containing personal diaries, we began to get to know the men who served aboard BB55. This project was getting personal. Who are the spirits that remain aboard? Why are they still here? Are they all from the battleship? We heard so many voices, more voices than listed as those who gave their lives fighting for our freedom. We used what we learned from the first investigation to develop a new grid system to schedule and track up to 4 sub teams of investigators, utilizing a timed schedule for movement of personnel in each investigation area. The grid enabled us to identify and prevent noise contamination such as people walking, talking, or making noise on other levels. Time stamps made it was easy to compare recordings from others who may have caused, or heard the same noise. Using multiple recorders allowed us triangulate sounds, and led us to discover that a blood curdling scream heard in one area, was nothing more than a laugh in another area. The sound had morphed as it echoed off metal bulkheads. EVP evidence of whispers, strange grunts and sounds of shuffling (when no one was moving) was frequently recorded. Near the Warrant Officer’s mess the whole group heard sounds of small low flying aircraft. Unlike the small planes and jets that fly into the local airport, these sounded as if several small prop engines were nose diving through the night sky. Shadows are a frequent sight near sick bay and in the main mess. Even without photographic evidence, we stand sure that the Battleship is home to multiple entities. Cadence and timber of EVP recordings have matched to those in our first vigil. The Port City crew enjoyed volunteering during the “ghostship ” Halloween event each fall. Ghost Ship was never an official investigation but the ghosts made themselves known none the less! We think it deserves mention here,because no matter what date or time of day the ghosts of BB55 are always active. 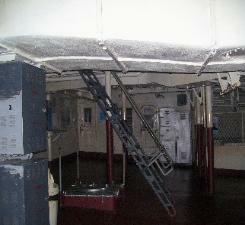 Frequently, visitors and staff report seeing shadows in the mess area, or fully uniformed men walking the deck. 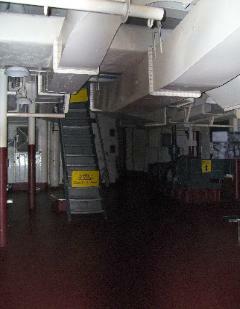 One very hot night, during ‘Ghost Ship’, I witnessed a tall shadow figure walk the length of the main mess. Dismissing the sighting at first, it took a second sighting, more than an hour later, to convince me I actually had seen the SHADOW that reportedly haunts the mess. The apparition appeared three dimensional, but no light could escaped that blackness. Twice, the wraith moved slowly from left to right only to silently vanish into the bake shop bulkhead. I couldn’t wait to share the experience with Doug , but Doug had his own experience to share! He had witnessed the same specter, from the left side of the mess. Doug described the apparition as solid, blocking all light as it toward the bake shop”. We both agreed the figure was that of was a very tall, well built man. We added more cameras and streamlined our setup. All cameras recorded sound and each investigators had personal recorders! This was a joint investigation by two paranormal teams. We feel that this is beneficial in several ways. In joint investigations, we learn from others, share evidence, and make many lasting personal friendships. 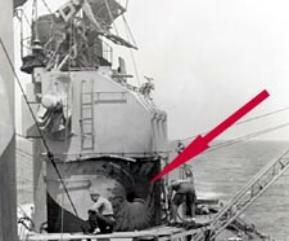 Not every investigation of the Battleship produces astounding evidence, but any evidence becomes more important when repeated over several investigations. Paranormal investigation is a hurry up and wait task, Rush to set up and then sit and wait for something to happen. Sometimes it can get boring, but when we relax, communication increases. We think the men of BB55 enjoy commenting on our small talk! 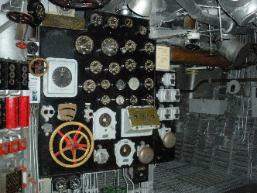 Port City is a non provoke team, and our research of the battleship is a testament to that approach. We have found that a gentle, conversational tones elicit more responses than the antagonistic tirades used on television. Like I said, this has become personal, we are getting to know the ‘Boys’ and their personalities, we feel like friends. Why they remain on the ship is unknown. We hope someday they will tell us more. We listen in the darkness, and hope to give comfort. Again and again we ask: What happened to you? Can it happen to me? Port City Paranormal continues to study the ship. The data collected from our visits is currently being statistically evaluated.